If West Vancouver Council approves the implementation of the B-Line and traffic congestion increases dramatically (if possible), what mediation plans would be considered? What metrics would be used to determine the extent of increased traffic congestion? TransLink and the DWV will be monitoring the performance of the B-Line service (indeed, all bus routes using this corridor), as well as any subsequent traffic impacts. Please share the data showing boardings and alightings in Dundarave, Ambleside, and Park Royal by Bus line taken (eg. 250, 250a, 253, 255 etc). Also, how many unique passengers are riding these lines? This can be ascertained from unique identifiers of the compass cards. As this data was produced using our automated passenger counts, it is not possible to determine the number of unique passengers or their destinations. For example, passengers boarding the 250 in Ambleside or Dundarave may continue to Vancouver, or, transfer to the 239 at Park Royal to continue to North Vancouver. One way TransLink monitors passengers activity on the network is by looking at passenger journeys. Passenger journeys are trips completed within the 90-minute fare window that includes a boarding, alighting and any potential transfers. As passengers are not required to tap off when exiting a bus, TransLink does not necessarily know the destination of passengers who end their journey on a bus. We use an algorithm to successfully infer the bus alighting locations for approximately 85% of all bus boardings based on the user’s next transfer or next boarding location. Therefore, all passenger journey data is likely to be an under-approximation as it does not include trips with individuals with missing destinations that are not inferred. Only data that have complete journey start and end locations (actual or inferred) are included in passenger journey data. Also, passengers that don’t interact with the system (fare evaders, children under 5, etc.) are also not captured in the data set. Our passenger journey data shows there are nearly 10,000 unique passenger journeys in West Vancouver each day. Roughly 2,100 West Vancouver transit trips are destined to North Vancouver each day, and 4,800 are destined for the City of Vancouver. Of the trips to/from North Vancouver, about half are travelling to/from Park Royal and the other travel west of Park Royal. The increase in capacity that the B-Line is intended to attract new ridership, and the proportion of North Vancouver trips are expected to increase as the quality of service increases. Boardings and alighting figures were provided to demonstrate that transit is an important part of the West Vancouver transportation system. These figures provide insights into the type of activity we should expect within a community. Leave load provides important insights into how many passengers travel through a particular area, but it may not indicate where passengers start or end their trip. Slide 11 on TransLink’s presentation to West Vancouver Council on January 7th provides a measure of bus utilization on the corridor. It shows the leave load for eastbound customer and arrive load for westbound customers on an average weekday at 5 key intersections on Marine Drive in West Vancouver. You state there are no proposed changes to bus routes west of Park Royal, yet the plan states: "Allows efficiency gains to be reinvested in additional local service". So, how would efficiencies be realized without alteration to the existing capacity on the 250A, 250, 251,252,253,255,258? The proposed business access and transit lanes have the potential to reduce the operating costs of existing service by improving reliability and reducing delays caused by congestion. We’ve committed to reinvesting any operational savings back into the services these savings come from. The current service proposal does not include changes to existing local service, as the full extent of the savings would not be realized until after the launch of the B-Line. TransLink would consider the best use of potential savings and implement any new service as part of our quarterly service change. If Park Royal is selected as the western terminus of the Bline, how would a 60" articulated bus manage the the turnaround? What would the path through the shopping centre look like? Detailed design of the turnaround path has not yet been completed. Has there been any estimates made on the impact of greenhouse gas emissions changes in West Vancouver as a result of adopting the B-Line proposal in its entirety, over time? Please also provide the assumptions used for such an estimate. If an estimate does not exist, why not? 2. A USEPA tool called Motor Vehicle Emission Simulator (MOVES). These tools measure the release of particulate matter and greenhouse gases in a variety of conditions. Unlike greenhouse gas emissions, the effects of particulate matter are felt at the local level. As such, diesel engines are required to meet strict engine standards for the release of particulate matter to protect human health. The actual impact on air quality will vary depending on the condition, but generally speaking, an articulated diesel hybrid releases one-quarter of the particulate matter of a large sedan (SUV) and about three times the carbon dioxide. Considering the much larger passenger capacity of an articulated bus (i.e., 110 people), the per person emissions of the B-Line are considerably lower than a personal vehicle. Does Translink have any data that shows how many of the 7,816 boardings and alightings to/from Ambleside and Dundarave were specifically to/from North Vancouver vs Downtown? Roughly one-quarter of all West Vancouver transit trips are destined to North Vancouver and half are destined for the City of Vancouver. Of the trips to North Vancouver, about half are travelling from Park Royal and the other half originate west of Park Royal. The increase in capacity that the B-Line would provide is intended to attract new ridership, and the proportion of North Vancouver trips are expected to increase as the quality of service increases. The consultation closes on February 28, 2019. A consultation summary report is expected to be available by the end of March. Are there any considerations for allowing carpools and electric vehicles to use the designated bus lanes? A representative from TransLink responded to this same question at a stakeholder meeting. Those stakeholders in attendance heard that experience with allowing carpools in transit priority lanes, similar to an HOV lane, are not being considered here. This is because past experience has demonstrated that this negates any benefit for transit priority measures. Is there an underlying reason why questions and answers have not been posted for over a week? Thank you for your question. There have been a much higher than usual volume of enquiries and it is taking longer than expected to obtain responses. In some cases, questions have been referred to TransLink for a response, and they are also experiencing a higher than usual volume of questions. Your response to my prior question was not responsive since it simply states that the terminus is no longer being considered to be located in front of Irwin Park but fails to confirm that the buses will not turn around in front of Irwin Park to begin proceeding East along Marine? If that remains a possibility, please respond to my prior questions about whether studies have considered the effect on student safety and exposure to pollutants and provide copies. Thank you. The District is hearing strong opposition to the B-Line bus running near Irwin Park School, and Council will seriously consider that feedback when the consultation summary report has been completed. At this time the consultation is seeking feedback on the terminus locations. The routings have not been determined. The 239 (which runs Park Royal to Cap U via Phibbs Exchange and Lonsdale) is being removed as it duplicates several other routes, including the B Line. The 240 will be increased in frequency and extended to Lynn Valley. The 255 will be rerouted to provide service to 3rd Street/Central Lonsdale/Lions Gate Hospital. This will make provide a more direct connection to Cap U and will make up for the deletion of the 239. A new bus service from Phibbs Exchange to Cap U to help B Line passengers get to Cap U. More information can be found on page 21 of TransLink's consultation report on the B-Line page. Please share data from TransLink's Automatic Passenger Count showing boardings in West Vancouver. I noticed the forecast in B Line ridership on this slide deck https://www.translink.ca/-/media/Documents/plans_and_projects/bline_consultation/2019-01-11_District_of_West_Vancouver_B-Line.pdf on page 24. What is the anticipated effect on number of cars/trucks moving through the stretch between Dundarave and Park Royal, now and compared to the same forecast period (year 2035). Using existing traffic counts, TransLink employed a globall- recognized traffic simulation model to predict the impact of the proposed lane changes on existing through traffic. The modelling shows a five second delay in travel time over five intersections. This modelling used a conservative estimate and did not assume any modal shift that may result from travellers who presently drive shifting to taking transit. How many employees of West Vancouver Municipality use transit today to get to work? How many use transit from North Vancouver or BURNABY to get to work? Same questions for West Vancouver School District? What is total number of employees of West Vancouver? 78% of people who work in West Vancouver commute from other municipalities. This includes North Vancouver, Burnaby and beyond. As of today’s payroll data, there are 800 permanent District of West Van employees. There are 1537 active employees, including temps and casuals. We do not have statistics on how many take transit to take to work, but anecdotally, we are very aware that many of our co-workers do so. The District of West Vancouver does not have data on School District employees. There are limited east-west transit connections across the North Shore today. Improved east-west service would provide the option of transit for many who commute to West Vancouver. What is the passenger capacity of the following buses- local shuttle buses, regular buses and B Line buses? Community Shuttles can accommodate 24 passengers. Regular buses can accommodate approximately 73 passengers. The new B-Line buses can accommodate 110. In one answer you say there are 2,080 trips by bus each day between West Vancouver and North Vancouver. Does this mean 2,080 trips or passengers each way or 1,040 trips or passengers each way? In a similar vein you talk about 8,000 in total getting on or off buses between Park Royal and Dundarave which equates to 4,000 people- does this mean 4,000 people each way between Park Royal and Dundarave or 2,000 each way? A trip refers to a journey that occurs in a single direction. It does not refer to passengers. Similarly, boardings and alightings refer to instances where buses are boarded and alighted—they do not refer to passengers. I've heard the 239 will be cancelled when the B-Line comes in, and that some other routes will change. Can you please provide details? I understand that the B-Line buses are diesel hybrid buses, but what does this mean for diesel emissions? Won't these buses still emit exhaust? All B-Line buses will be brand new, hybrid electric/diesel buses and are equipped with particulate filters. TransLink drivers turn off engines when stationary for more than 3 minutes. In an American study, these buses (1410 New Flyer XDE60) emitted .85 grams/mile of NOx and diesel particulate matter emissions under city driving conditions, which is equivalent to less than 2 diesel Jeep SUVs. I am trying to get a visual idea of what the B-line will be? I looked on Translink website ...could it be the "New Flyer Articulated Low-Floor Diesel-Electric Hybrid" ? What bus model is the 250 Bus ? Thank you for answering my previous questions. Very helpful. The 250 bus is a standard-length New Flyer Diesel-Electric Hybrid bus. The B-Line buses will be a similar model, except they will be longer and have a bendable (articulated) section in the middle. You may be familiar with the articulated buses on the 257 route, as well as the other existing B-Lines (99, 96, 95). The new B-Line fleet will consist of all new buses. Here is a picture of an articulated bus from the Translink Fleet Pictorial. Please check your replies regarding the passenger count for Dundarave. The graph given for Automatic Passenger count is just over 2 000 for Dundarave and looks like an incremental 1000 for 21st. So that's actually 3 000 ... not 8 000?? "Dundarave and Ambleside is a busy transit corridor today. On an average weekday, there are 8,000 boardings and alightings (people getting on and off) in Dundarave and Ambleside." The graph on page 11 of this slide deck refers to how many people are on the bus when it leaves the indicated stop. For example, if a bus arrives at 24th Street with 20 passengers and another 10 get on while 5 get off, the leave load would be 25, but the boardings and alightings at that stop would be 15. The slide on page 12 shows the daily boardings and alightings for the West Vancouver section of the corridor, which is 8,000. While there is some overlap between these figures, they are not counting the same thing and thus reflect different figures. Will there be changes to the lane configuration currently at the intersection of 23rd Street and Marine Drive? If so, what will the intersection look like? What is the overall length and width of the B-Line buses? What will the various lane widths along Marine drive be from Dundarave through to Park Royal? The intersection of Marine Drive and 23rd Street currently has two lanes westbound and one lane eastbound, which expands to two lanes on the east side of the intersection. Under the proposed plan, the intersection will have one lane for through traffic in each direction, plus one lane in each direction for buses, bikes and vehicles turning right. For more information, including a diagram on page 9, see the information package on the West Vancouver website: . The articulated buses that will operate on the B-Line will be 2.6 metres wide and 18.5 meters long. For comparison, the standard buses that operate on Marine Drive today are the same width and 12.4 metres long. Lane widths vary across the corridor. General traffic lane widths range from 3 to 3.5 metres, while bus/bike/right-turn lanes vary from 3.3 to 3.5 metres. For comparison, existing travel lanes vary between 3 and 3.5 metres. The proposed design makes very few changes to the widths of the lanes. Where can I find data from TransLink about ridership demand? Ridership demand starts on page 9 of this slide deck, which lives on TransLink's B-Line page, under the West Vancouver segment. What impact will the B-Line have on other bus routes? What kind of changes will there be? Here is the link to TransLink's consultation report from April 2018. Route changes are listed on page 21. Has the option of a western terminus in Ambleside around 13th to 14th been considered? The passenger count is 2,000 at 24th, and 9,000 at 14th. Also, on average less than 25% travel to North Vancouver, which raises a related question: does Translink's planning criteria support a B-Line terminus extension in order to reduce the transit time for well under 1,000 riders a day? At the request of The District of West Vancouver Council, TransLink is exploring alternative termini along Marine Drive in West Vancouver. Currently, people travelling from West Vancouver to North Vancouver by bus have to make a transfer to complete their journey. If the Marine-Main B-Line is implemented in West Vancouver, we project an increase in transit trips because of the fast, reliable and nonstop service between the two communities. What time will be saved if the traffic improvement measures are implemented but without the "shared bus lane"? This option has not been modelled because we know that introducing left-turn bays without implementing bus-priority lanes won’t have a significant, positive impact on B-Line travel times. The addition of left-turn bays would have a slight positive impact on traffic flow, similar to the effect of left-turn restrictions. However, implementing the left-turn bays will still have the same impact on parking, with or without the shared bus/bike/right turn lane. Additionally, without bus-priority lanes, bus reliability benefits would not be realized because buses could get stuck in traffic. Today, it takes an average of 15 minutes to get from Dundarave to Park Royal on the bus in the afternoon, but 1 in every 4 trips takes 30 minutes or more. Transit in their presentation of January 7 to Mayor and Council mentioned that West Vancouver had the highest % growth rate of 9.8% ( I think) of the North Shore Municipalities. What would that growth rate be if you excluded the Horseshoe Bay passengers ( or buses)? Excluding the 257, bus ridership grew 6.1% between 2017 and 2018. For comparison, bus ridership rose by 5.8% in the City of North Vancouver and 8.5% in the District in the same time frame. Since no-one, to my knowledge, has objected to an increase in the number of buses, and since almost everyone has objected to the effective closure of two traffic lanes, what is the measurable incremental benefit of closing those two lanes - compared to the alternative of simply keeping the lanes open? The proposed plan, which includes converting a general-purpose lane in each direction into a bus-priority lane, has two major benefits for bus travellers. 1) Buses will be 30 per cent faster. During the afternoon peak, it currently takes about 15 minutes for a bus to get from 25th Street to Park Royal. A bus-priority lane would reduce this time by 5 minutes or 30 per cent. 2) Bus trips will be more reliable. A trip from Park Royal to Dundarave usually takes about 15 minutes, but it varies from day to day. One in every four of those trips take upwards of 30 minutes. Travellers who have limited time or need to be somewhere at a specific time may not be able to risk arriving late due to a delayed bus. While it is more difficult to predict the exact improvement in reliability from the proposed design, we do know from other examples in the region that buses become more consistent and reliable with these types of measures. The District recognizes that a lack of timely, accurate information regarding the proposed B-Line has created frustration and concern, and we apologize for that. We are committed to conducting a community consultation that is transparent, inclusive and will ensure that residents have more information than we have provided before. Everyone will have access to the same infomraiton and the opportunity to be heard. What will time be saved between Park Royal and Dundarave be if B Line implemented? I guessed about 5 minutes? Correct. We expect about five minutes of average travel-time savings during the afternoon rush hour for a B-Line bus. In addition, all buses that travel along Marine Drive will benefit from time saving and improved reliability. While it normally takes a bus about 13 minutes to go from Dundarave to Park Royal in the afternoon peak, one in four trips take up to 30 minutes. Implementing transit priority would reduce the variation in travel time, making buses a more reliable and attractive option. Time saved from B-Line implementation is calculated for a number of different destinations, not just between Dundarave and Park Royal. The further you are travelling, the more time you save, as illustrated in this graph. Existing Blue Bus routes would also save time and run more efficiently if they had a transit priority lane to operate in. It appears Translink just added a new sign saying the 257 horseshoe bay express bus is now a drop off only at 14th. This is NEW and to the has never been a part of the 257 route. This ENTIRE passenger count (4,000+) is ADDED to the pick up and drop off in Ambleside - Dundarave, which falsifies the numbers. Are council and staff aware of this and looking into it? There has been no change to the stopping pattern of the 257 for over 20 years. 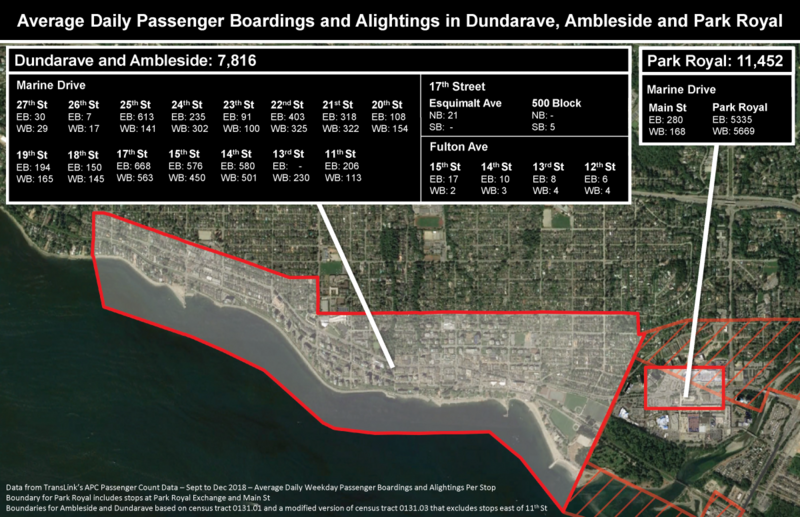 The 8,000 boardings and alightings in Ambleside and Dundarave does not include passengers who ride through on the 257. Included in the 8,000 are people who board or alight the 257 at Marine Drive or 14th Ave, which amounts to 50 of the 8,000 (0.5%) boardings and alightings in Ambleside and Dundarave. Please confirm that Buses will have priority in the other traffic lane when bus lane blocked by trucks or people parking or people turning right that block bus lane? Buses will only have priority in the bus-priority lane. The centre lane will continue to operate as a general-purpose traffic lane. Buses will be able to change to the centre lane to go around obstructions, but there is no special treatment for buses when they are in the centre lane. What is total bus passenger capacity per day today between Park Royal and Dundarave? What will total bus passenger capacity be with B Line and other buses? What is number of passengers today travelling between Park Royal and Dundarave each day? What is number of passengers excluding HorseShoe Bay buses per day? Total bus capacity per day between Park Royal and Dundarave: Will get back to you. Total bus passenger capacity if B Line is implemented: Will get back to you. Number of passengers travelling between Park Royal and Dundarave each day: there are 8,000 daily boardings and alightings each day or approximately 4,000 people. Number of passengers excluding Horseshoe Bay buses per day: there are 8,000 daily boardings and alightings each day or approximately 4,000 people. What is number of passengers per day travelling between West VAncouver and North Vancouver today? What is total bus capacity per day? What is number of passengers per day travelling from West Vancouver to downtown? What is total bus capacity per day? There are approximately 2,080 daily trips between West and North Vancouver. There is currently only one bus that travels straight from West Vancouver to North Vancouver (255) and it runs every 15-30 minutes, depending on the time of day. The proposed B-Line will give people a faster and more reliable option, which will attract new riders. Number of daily passengers travelling from West Van to downtown: 4,750 daily trips. We'll get back to you with the total bus capacity. What are the number of people boarding buses every hour in a 24 hour cycle at Dundarave through to and including Ambleside before Park Royal ? Thank you for your question. There is information about the number of bus passengers in this presentation TransLink provided to Council on January 7. Thank you for your question. This topic is addressed in TransLink's presentation to Council dated January 7. Traffic modelling shows that the proposed lance changes will have a neutral or positive impact on car traffic. Despite this, alternatives were explored. The explanation and results can be seen in this presentation file. Please share the data that supports the need for the Bline buses between Ambleside ( 21st) and Dundarave (25th). Please show the routes that those with cars will likely take to avoid the inevitable congestion on Marine Drive (this should/would have been studied). Dundarave and Ambleside is a busy transit corridor today. On an average weekday, there are 8,000 boardings and alightings (people getting on and off) in Dundarave and Ambleside. About 50 (0.5%) of these people board or get off the 257 in Dundarave/Ambleside. The 8,000 figure does not include people that have already boarded the 257 at Horseshoe Bay and are just passing through. Most people on the 257 are travelling to Park Royal or Downtown Vancouver. The road improvements are designed to improve the flow of through-traffic for cars and studies do not indicate additional congestion. With no addtional congestion, and a projected improvement in traffic flow, it is not anticipated that car traffic will re-route into adjacent neighbourhhods for that reason. A suggestion from a previous post seems to make a lot of sense - re-route the Horseshoe Bay Express to the SeaBus. This would address several issues: 1) no need to change road infrastructure since the route mostly goes along Highway 1 in West Vancouver, 2) add bus capacity where it is needed (many 257 buses currently run full), 3) greatly improve transportation times and convenience for those travelling between Horseshoe Bay and North Vancouver (there is currently no direct transit option), and 4) reduce bridge traffic by redirecting to SeaBus. Has this suggestion been considered by TransLink? Why is it not an option that is presented as part of the consultation? Thank you for your question. The project before us is for a B-Line. We are not consulting on any other changes to public transit at this time. The B-Line proposal was developed for many reasons, including the fact that Dundarave and Ambleside is a busy transit corridor today. On an average weekday, there are 8,000 boardings and alightings (people getting on and off) in Dundarave and Ambleside. About 50 (0.5%) of these people board or get off the 257 in Dundarave/Ambleside. The 8,000 figure does not include people that have already boarded the 257 at Horseshoe Bay and are just passing through. Most people on the 257 are travelling to Park Royal or Downtown Vancouver. The next phase of transit improvements, after the North Shore B-Line, is anticipated to be a B-line from the North Shore to downtown Vancouver. Where does it show the BLine bus looping past / staging at Irwin Park School? I can't find it on this website? Thank you for your questions. The proposed plan no longer includes a terminus located at Irwin Park School. In the recently posted information materials, three options for a terminus location are being presented for community input. What studies have been conducted in relation to the potential changes to air quality at Irwin Park Elementary School and increased risk to student safety due to the proposed increased bus traffic. What were the results of those studies and where are they available for review? Thank you for your question. The consultation that was launched on January 28 does not include a proposed terminus location by Irwin Park School. You'll find up-to-date information in the posted materials, and information about how to provide your input. Please provide the summary details of the current DWV & TransLink overall bus partnership? Who pays who for the Blue Bus operation? Does TransLink's takeover this month of the Horseshoe Bay Express Bus operation figure into the B-Line plan? There are two unions involved who do not seem to get along. DWV is silent on changes to existing services if the B-LIne is implemented. Will there be cuts to existing services and / or additions to frequency and routing of existing routing? Is Translink paying West Van to make the street changes on a cost recovery basis or is there an incentive involved? And how much ? Has anyone seen DWV's staff analysis of the B-Line since June last year? TransLink is a regional transportation authority overseen by the Mayors' Council. TransLink is responsible for planning, financing and managing transportation modes and services in the Metro Vancouver region. The services themselves are delivered through operating companies and contractors, including Coast Mountain Bus Company (which includes Seabus), West Vancovuer Blue Bus, West Coast Express, and British Columbia Rapid Transit Company (Skytrain). Blue Bus service is contracted out to TransLink and is fully funded by TransLink. If the B-Line proposal is approved, it will provide benefits to the existing Blue Bus service by way of efficiencies through the road improvements. TransLink has stated that any efficiencies realized in West Vancouver due to the B-Line will be re-invested back into Blue Bus services. Why doesn't West Van make improvements to traffic flow through Ambleside regardless of the B-line decision? Elimination of left turns at odd-numbered streets is a low-cost obvious move. Currently, the street improvements are part of the B-Line proposal and would be paid for by TransLink. If, after the community consultation is complete, Council does not approve the B-Line, the street iomprovements plan could be brought forward for Council to consider as part of a future budget. How much will Translink spend on road improvements and traffic light improvements etc between Park Royal and Dundarave? How much will the District of West Vancouver spend? If Council approves the B-Line is West Vancouver, TransLink will pay for the cost of all associated road improvements. The cost is not yet known, as the project must be fully designed and tendered before cost estimates are available. If the B-Line is implemented, will all left turns along the route be restricted to intersections that contain a left turn bay? Will all right turns have a turn lane so as not to block the single lane of through traffic? The proposal is to create a centre lane that prioritizes speed and reduced congestion of through traffic with left turn bays at 13th, 15th and 17th Streets. No left turns would be permitted at 14th and 16th Streets. The right lane would be for buses, bicycles, cars turning right, cars parking and cars entering business driveways. Right turning vehicles would not block the single lane of through traffic. Does the B line bus stop every 2 blocks from Park Royal to Dundarave, or will there have to be another bus service that does this on this route? Many users are elderly and can't walk to a bus stop any further away than a block. The proposal for the B-Line includes four stops in West Vancouver: 24th Street, 21st Street, 14th Street, and Park Royal. Other buses on Marine Drive will continue to stop more frequently. If the B-Line is approved in West Vancouver, those other buses would benefit from transit priority lanes and become more efficient. Parking is the focus of many complaints and should be separated from the B-line issue. Why don't you take steps to better allocate parking in Ambleside and Dundarave (with varied time restrictions as you did successfully at the library, and with pay parking in some prime locations)? Parking has been a topic under discussion for quite some time, as you note. Staff are completing a parking study for Ambleside, which will be shared with the community soon. Why is a dedicated bus lane needed in mornings when there is minimal traffic congestion between Dundarave and Park Royal? Suggestion. What about a direct bus from Horseshoe Bay terminal to the Sea Bus instead, if we have that option, I think that it will solve a huge car traffic to downtown and it would be very convenient for many of us in the North Shore. Not in favor of the B Line Proposal on Marine Dr. Not in the best interest of the community that live and work around there. There is already enough problem around there in dealing with parking, bus, trucks and regular everyday traffic. It is a nightmare at the best time imagine if they had more by taking away one line on the roads. Lastly, Seriously why do we need more consultation with this, when the residents have spoken loud and clear and said NO to this. Do we need to spend more money and time to hear the some Nooooooooooooooo, down the road. Better to invest the money and energy in cleaning up the municipality a little bit better that what we have seen, this far, or in the last 20 or some years. Thank you for your comments and suggestions. West Vancouver Council will be conducting community consultation and encourage you to participate by attending a meeting or sharing your input online, once the online feedback form is posted after January 28. Impact to parking is one of the topics in the upcoming consultation. Some options will be brought forward to reduce parking loss. Stay tuned for details. Terminating the B-Line at Park Royal is one of the options being considered. Please check back after January 28 to learn more about the proposed plan and the options being considered, and give your feedback. Is the planned public consultation a meaningless exercise for something Council has decided to do irregardless of public sentiment? The White Spot development, despite public objection, comes to mind. Council is going make its decision based on public feedback and the best possible information, in the best interests of West Vancouver. It’s Council’s decision. Assuming you have conducted a survey of all businesses along Marine Drive to West Vancouver as easy to do- what percentage supported the proposed dedicated bus lanes and what percentage supported removal of parking places? West Vancouver Council will conduct a comprehensive community engagement that will take place from late January to late February and will include stakeholder meetings for the business community. The results of the consultation will be considered at a Council meeting in the spring. What will happen to Haywood Avenue in front of Irwin Park School? How will it be changed? How will the bus traffic change between 24 & 25th Avenue on Haywood? As part of the upcoming community engagment, options for the configuration at the 24th Street terminus will be presented and input from the community collected. What discussion was there with the school board in regards to effects on Irwin Park school and Hollyburn school by the B-Line? As part of the upcoming community consultation, Council will be consulting with the school district on the B-Line proposal. Did West Vancouver consult with Businesses along the Marine Drive Corridor in Ambleside and Dundarave re parking space removals and traffic lane closures to create dedicated bus lanes for the B Line? What was result of the consultation? West Vancouver Council has committed to a comprehensive community engagement that will take place from late January to late February and will include the business community. The results of the consultation will be considered at a Council meeting in the spring. Are TransLink staff out marking sidewalks in Ambleside with spray paint because the B-Line is going ahead no matter what? No, TransLink is not going ahead with the B-Line in West Vancouver no matter what. They are, however, still working on finalized design drawings for the proposal. For this purpose, TransLink is collecting detailed information about underground utilities in West Vancouver.